Samsung Galaxy S8 and Galaxy S8+ are now a part of the One UI beta programme that is designed to offer the latest user experience along with the Android 9.0 Pie update. The Galaxy S9 and Galaxy S9+ were the first by the company to receive the One UI skin. However, the company also brought the identical experience to the Galaxy Note 9 and most recently opened the beta programme for the Galaxy Note 8 as well. One UI was unveiled as the successor to the Samsung Experience UX at the Samsung Developer Conference (SDC) last November. It is essentially designed to make one-handed experiences easier and more comfortable over the previous interface. Users with the Samsung Galaxy S8 or the Galaxy S8+ can join the One UI beta programme directly from the Samsung Members app. Initially, the beta programme has been started for the 2017 Samsung flagships in India. It is, however, safe to expect that the beta testing of One UI will be expanded shortly to other markets as well. If you're in India and own a Galaxy S8 or Galaxy S8+, you can join the One UI beta programme by downloading the Samsung Members app. You'll need to sign in with a Samsung account to register for the beta programme on the Members app. Once done, move to the Software update section from the Settings menu and then refresh the screen. The new update will be provided that should start downloading on your device automatically. 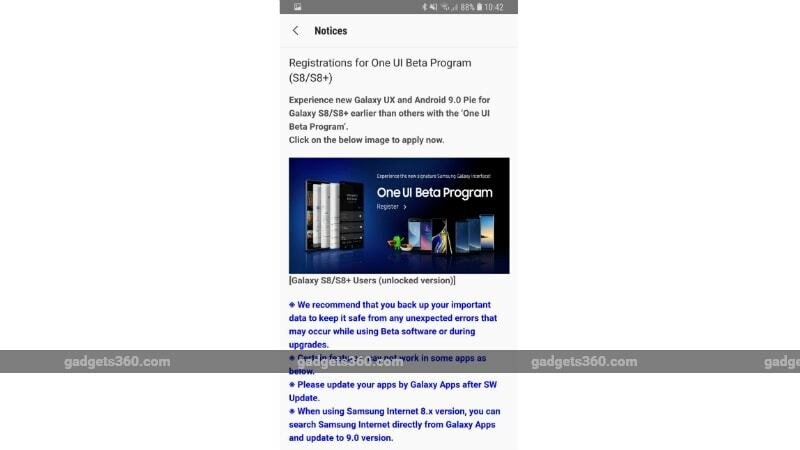 SamMobile reports that the One UI beta build for the Galaxy S8 brings firmware version G950FXXU4ZSA5, while the Galaxy S8+ gets version G955FXXU4ZSA5. We were able to independently verify the One UI beta release. Moreover, the update is around 1.6GB in size and brings the January 2019 Android security patch. Among other changes, One UI brings Android 9.0 Pie along with all-new gesture-based system navigation. Content, settings, and other information on the interface has also been reorganised to make one-handed operations easier and more comfortable over the Samsung Experience UX. Samsung started the beta testing of One UI on the Samsung Galaxy S9 and Galaxy S9+ back in November, soon after its debut at Samsung's annual developer conference in San Francisco. The company expanded the programme towards the Galaxy Note 9 and recently rolled out the stable One UI for the Galaxy S9, Galaxy S9+, and Galaxy Note 9. Earlier this week, the Samsung Galaxy Note 8 also joined the One UI beta programme, though it is expected to receive the stable release in February. The Galaxy S8 and Galaxy S8+, on the other hand, are set to receive the Android Pie update along with One UI skin in March, as per the roadmap posted on the Members app.